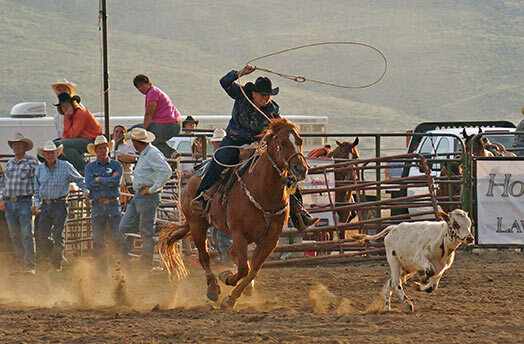 Breakaway roping is a variation of calf roping where a calf is roped, but not thrown and tied. It is a rodeo event that features a calf and one mounted rider. The horse and rider wait in a box next to the chute that has a spring-loaded rope, known as the barrier, stretched in front. One end of a breakaway rope barrier is looped around the calf's neck and stretched across the open end of the box. When the calf reaches its advantage point, the barrier is released. If the roper breaks the barrier before the calf reaches its head start, the roper is assessed a 10-second penalty. The breakaway rope is tied onto the saddle horn with a nylon string. When the loop is around the calf’s neck, the roper’s horse is pulled up so the weight of the calf will make the rope tight as it snaps off of the saddle horn, thereby helping the roper receive a time from the judge.